Rebecca A. Riger received her B.A. from The Ohio State University in 2007 and her J.D. from Capital University Law School in 2015 where she received the dispute resolution certificate for completing a concentration in dispute resolution. During law school, Ms. Riger mediated cases for the Franklin County Municipal Court and she earned first place in the 2012 Cornell University e-Mediation Competition Cyberweek. Ms. Riger interned with Capital University’s Legal Clinic, where she represented clients for domestic matters, criminal charges, landlord tenant disputes, peace orders, and served as a Guardian Ad Litem under the supervision of the clinic’s staff attorneys. Ms. Riger was sworn in to the Maryland Bar in 2015. Prior to joining Lebowitz & Mzhen Personal Injury Lawyers, Ms. Riger spent seven years as a legal assistant at a personal injury firm in Columbus, Ohio and two years as an attorney at a mid-size Baltimore firm handling complex lead paint poisoning cases and automobile crashes. Ms. Riger joined Lebowitz & Mzhen Personal Injury Lawyers in 2018. 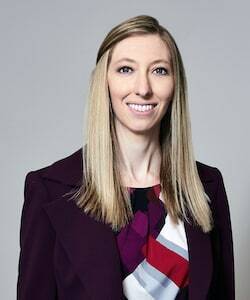 Ms. Riger is dedicated to vigorously advocating for the rights of her clients in and out of the courtroom. Ms. Riger resides in Baltimore. Ms. Riger is also passionate about health and fitness. During her free time, Ms. Riger instructs spin and boot camp classes. Throughout the process [of the motor vehicle collision case] you were available, responsive and up front. You were available for my questions, and my need for reassurance, and when the opportunity arose to better the outcome of my case, you did not shy away from the extra work. You have proven yourself to be an honest, realistic and caring advocate for the little guy in need. I will refer your firm to any who may be in similar need. John C.
I can't thank you enough for your efforts and dedication to resolving my case. I also want to thank you for your consistent professional manner, touched with that extra personal care that I sensed whenever we communicated. . . . You are a wonderful person and I wish you continued success. Again, thanks for everything. Hallie W.
I am proud to have had Lebowitz & Mzhen represent me in an automobile personal injury case I was involved with. Not only did they come through with a settlement worth far more than I thought possible, the entire office was always friendly, knowledgeable, and ready to answer any questions I had. Should an incident like this occur again, I will not hesitate to contact Lebowitz & Mzhen for their counsel, advice and representation, and I would wholeheartedly recommend them to anyone seeking honest and effective attorneys. Mark B.